I love butter. But, who doesn’t, right? Butter is one of those awesome real foods that you can easily make at home. This is especially important if you prefer to eat the most nutritious butter – raw, grass-fed butter. 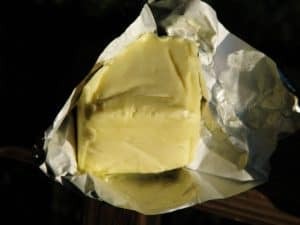 Before I get to how to make homemade butter, let’s talk about why you’d want to make homemade butter. A lot of people love butter, but many of us are afraid of butter. Why on earth do we fear a liberal or even moderate consumption of this nutrient-packed dairy product? As it turns out, butter is a powerful, health-promoting food. So, go ahead, eat more butter! Still skeptical? Rest your worries with this book – Eat Fat Lose Fat . It’s a must have book for all real food eaters. If you want to receive the maximum benefits from butter, raw milk butter from grass-fed cows is the best option. If you have a source of grass-fed, raw milk from which to draw cream, you can easily make nutritious homemade butter. If not, you can use conventional, store-bought cream to make butter. However, due to high temperatures during the pasteurization process and the diet of factory farm dairy cows the butter will be inferior in nutrition and taste to raw milk butter. If you have no choice except to use pasteurized cream, stay away from cream that has been pasteurized using the ultra-high temperature (UHT) pasteurization process. Look for low temperature pasteurized milk. Take a look at these pictures of conventional, pasteurized, store-bought butter and my own homemade raw milk butter. You can clearly see the difference. The raw homemade butter looks vibrant and delicious. Pasteurized, factory farmed, store-bought butter is pale and only slightly flavorful. Homemade raw, grass-fed butter is a rich, bright yellow and is super flavorful. 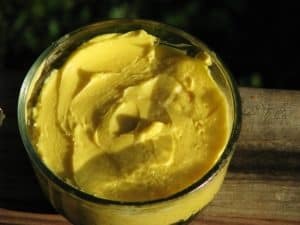 Why is Homemade Raw Butter Such a Bright Yellow? Just like my pastured eggs with their orange, nutrient-packed yolks, the raw butter shows its nutrients in its color and flavor. In the spring and fall, when cows are grazing on rapidly growing grass, the butter is a brilliant yellow and was prized in traditional cultures (and by real food lovers, like myself, today) for its nutritional properties. The first time I made butter from raw cream, I gasped at the color after I opened the flour cloth it had been draining in and glimpsed the first hint of vivid yellow. Beautiful stuff! So, how do you make homemade butter? There are two options. You can pour the cream in a food processor and let it go to work or you can use a hand mixer or stand mixer. I have used both a food processor and a hand mixer and prefer the food processor method. Either way it takes about 20 minutes to make. Pour the cream into the food processor bowl or a mixing bowl. Begin the mixing process. The cream will begin to bubble and froth and eventually it will turn into whipped cream. Stop the food processor or mixer, scrape down the sides of the bowl then continue mixing. Once the whipped cream texture begins to break, you’ll notice it getting lower in the bowl. Continued mixing will cause the solid butter and the buttermilk to separate. The cream will get thicker and then grainer. When you notice liquid in the bowl separated from the fat, it’s time to take the butter out of the bowl. It takes about 10 minutes to get to this step. Remove the butter from the from the bowl and place it in a fine mesh strainer. After the buttermilk is drained and squeezed out pour ice cold water over the butter and mix/process it for a bit longer. Add salt to taste. This is optional. I usually don’t add salt. However, adding salt helps the butter to last a little longer without fermenting. Slather it on some homemade sourdough bread and enjoy your hard work. Once the whipped cream texture begins to break, you'll notice it getting lower in the bowl. Continued mixing will cause the solid butter and the buttermilk to separate. The cream will get thicker and then grainer. When you notice liquid in the bowl separated from the fat, it's time to take the butter out of the bowl. It takes about 10 minutes to get to this step. Add salt to taste. This is optional. I usually don't add salt. However, adding salt helps the butter to last a little longer without fermenting.